The fabric is mostly cotton + steel. 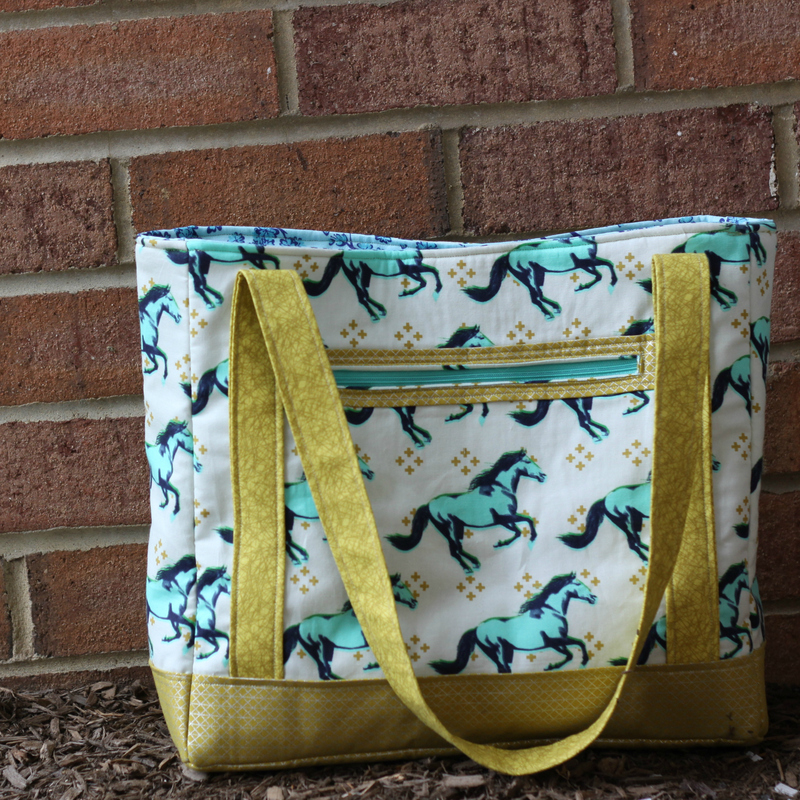 The pattern is the Tudor Bag by Sara Lawson of Sew Sweetness. I was nervous to make it because I thought bags were beyond my skill level, but it worked pretty well! I think that if I made this pattern a second time, I could probably iron out any remaining mistakes. The pattern was written really well, not leaving details to the imagination. I like a pattern that walks you through even the simple steps. You get the info you need for the tricky steps, and you get to feel like a know-it-all when you don’t need the photos! My mom saw a photo of this bag and said she’d been wanting a tote, so it seems like I will get to perfect my technique with this bag, after all. I normally hate making the same pattern twice, but I’m excited for this one for some reason. Maybe it’s because I will use different options the second time that I was too scared to try the first (optional single shoulder strap and zipper main closure instead of a magnetic closure). I’m even thinking I’ll add another pocket to the back and an interior zip pocket. Since I didn’t photograph the Christmas gifts I made my family, this is my last finish for 2014. Happy New Year! This is beautiful! I’ve been rooting around for the perfect handbag patten for quite a while, and I think this is it. I like the way you made it with only the top handles. Thanks for sharing this. I have been collecting patterns, too, and was happy I waited for this one. Hope you enjoy it as much as I did!